11 Nov, 2015 - Iran’s social media has been falling over itself in the past week over reports about Microsoft’s quiet but real entry into the Iranian technology sector. But is this really Microsoft entering the Iranian market? Well, not exactly. Based on Fras News Agency (The official news agency of the Iranian Government) deep investigation of the issue in September, the companies calming having the exclusive official agency of Microsoft are just simple importers of Microsoft Mobile Lumia from United Arab Emirates. Based on official list of foreign companies in Iran published by the Ministry of Trade & Business there is no company having an official agency of Microsoft. In May last year, the US relaxed some of those sanctions, allowing US companies to sell mobile phones, software, and other communication technology to Iranians. The exemptions only affected individuals, not the government, and Iranian customers couldn't really buy the products themselves owing to other financial sanctions. Collin Anderson, a researcher who campaigned against the technology sanctions on Iran, thinks that entering the Iranian market could pay off for Microsoft financially. “The market in Iran is huge. This isn't some small country: this is nearly 80 million people,” he pointed out. In the future, Iran may “be a very advantageous place to go into” for businesses. In October, Motherboard news - a tech news website said a recent Microsoft feedback questionnaire showed there’s huge demand for the company’s services in Iran. Users voted over 30,000 times for the suggestion, “Please give the people of Iran to access the Microsoft Store. Thank you.” Meanwhile, Tom Warren at The Verge pointed out that a plea to include the Persian calendar was among the most-requested features in a Microsoft poll asking for feedback on the Windows 10 operating system. There's certainly a big market for Windows and Office in the country. Over 90 percent of computers use a version of Microsoft Windows, according to Stat Counter - though it's likely given the circumstances that many of those are running pirated systems. Also most of the public and private organizations are using Microsoft Technologies and Servers including Windows Server, SQL Server, Sharepoint Server and even Windows Embedded. Despite the sanctions, most Microsoft products are already available in the country via unofficial channels, so it’s no surprise that local consumers are already running Windows 8 and Windows 10 or using a Surface tablet for their daily tasks. Till now the only company operating in Iran and having its relationships directly with Microsoft is the official representative of IT Researches (UK Well known IT and Computer Research Company) having its own independent office in London (Named Talee) from 2013 and selling Microsoft Products as an official Microsoft Partner (Partner ID 4560062). 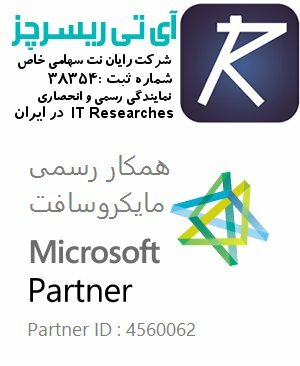 This company was selling Microsoft Software Products form 2010, but from 2013, after opening its office in London as a UK company it is the first and only one in Iran Having direct and official relationships with Microsoft as a Partner in UK. Unfortunately Talee (Operating as Rayan Net Co in Iran) offers only Microsoft Software Products and Solutions and there is no official Hardware distributor till now, most of the Microsoft Hardware available in the Market is imported from UAE unofficially and not directly from Microsoft. While buying a Surface is easy when you travel in the United States or any other country where retailers are already selling Microsoft’s products, there’s no doubt that Windows is much easier to obtain in Iran through the Internet. The problem, however, is that many local users are actually running pirated copies of Windows, so launching its products in the country would be a win-win situation: customers could purchase legitimate Windows licenses, while Microsoft would reduce piracy and sell more products. Company Name: IT Researches Ltd.